363 Copa De Oro Road, often referred to as The Pink Palace, is a luxurious red-brick mock 18th-century French mansion on Copa De Oro Road in the affluent East Gate Bel Air neighborhood in the hills of Los Angeles, California. It lies in very close proximity to Château des Fleurs and Bel-Air Country Club and is noted for being the home of numerous celebrities including Dean Martin, Sir Tom Jones and Nicolas Cage. The house is situated in East Gate Bel Air on Copa De Oro Road ('cup of gold' in Spanish), which was "coined to reflect the millionaire status of its inhabitants". Copa De Oro Road was named in 2015 as one of the "15 Priciest Streets in America", with a median home value estimated at US$10.264 million. The house was the home of Dean Martin in the 1960s and early 1970s. In 1966, during a concert at the Sands Hotel and Casino in Las Vegas, Sinatra mentioned the house and the "evenings of fun" that he, Martin, and others would have. Sinatra joked that they would drink until 3:30 am and then eat dinner and be dragged into the dining room lying on their backs by Martin's mother-in-law Peggy and a "big dog". Martin sold the house to Sir Tom Jones for $500,000 in June 1976. Jones resold it to Nicolas Cage in 1998 for a reported $6.469 million. It has since been valued as high as $35 million since going on the market in 2007, but as of 2015 it is worth $10.4 million. The red-brick property, 11,817 square feet (1,097.8 m2) in size, was built in 1940 by Gerald Colcord. It has six bedrooms and nine bathrooms. The house was built in the 18th century country house style, and is noted for its polished wooden paneling in the interior. When Tom Jones purchased the property in 1976 he had all of his furniture from Weybridge shipped over and stepped up security by installing electronic gates, "adorned with Welsh dragons". ^ a b Ellis 2009, p. 342. ^ Kim, Susanna (17 April 2015). "See the 15 Priciest Streets in America". ABC News. Retrieved 13 November 2015. 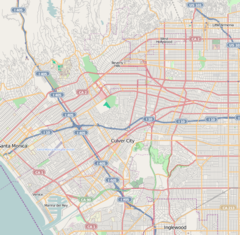 ^ The Movieland Directory: Nearly 30,000 Addresses of Celebrity Homes, Film Locations and Historical Sites in the Los Angeles Area, 1900–Present. McFarland. 10 August 2010. pp. 111–. ISBN 978-1-4766-0432-9. ^ a b "Nicolas Cage's Foreclosed Estate". Priceypads.com. Retrieved 11 November 2015. Ellis, Lucy (17 December 2009). Tom Jones Close Up. Omnibus Press. ISBN 978-0-85712-107-3.